← How to extract PDF Table? PDF to Flash Flip Book Converter could make PDF publishable on web and blog, and PDF to ePub Converter, HTML to ePub Converter could make PDF and HTML readable in ebook separately. PDF to Flash Flip Book Converter, which can not only convert PDF to flash, but convert PDF to HTML and PDF to JS with command line, is a small-size CMD application to help you make flip book that could be embedded and shared on website and any blogs as you want. You could free experience PDF to Flash Flip Book Converter here. PDF to ePub Converter, which helps you convert PDF to epub singly or in batches, can make PDF display in ebook suiting for various portable devices, e.g., ipad, iphone, sony players, samsung players, itouch etc.. 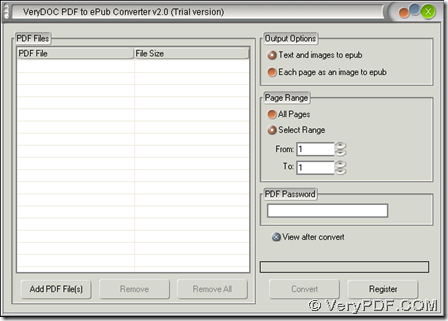 Here is download entrance of PDF to ePub Converter, then you can start to experience it right now without any fee! HTML to ePub Converter, as its name says, it could convert HTML to epub and HTM to epub singly or in batches, which is also a tool to make HTML and HTM portable in small electronic devices – ipad, itouch, iphone etc.. To get free version for a trial, do not hesitate to click here. In addition, PDF to Flash Flip Book Converter, PDF to ePub Converter and HTML to ePub Converter support different targeting properties in many aspects you want to adjust, besides basic use from PDF to HTML, PDF to flash, PDF to JS, PDF to epub and HTML to epub separately and accordingly. To know more similar-functional products, like Free Epub Ebook Reader, you could click here 1, for example. To experience what PDF to Flash Flip Book Converter could bring you, please click here 2. At last, to know more conflicts among these 3 products and maybe more products, please keep concentrating and supporting our articles, news and software at VeryPDF Knowledge Base and VeryPDF.com. Also for any questions, please feel free to contact us via support@verypdf.com. Thank you! How to convert Excel reports of PDF to HTML formats for website building? How to convert different page range PDF to flip book of SWF in batches? How to convert PDF to HTML of flip book in batches? How to customize suitable dimension flip book from PDF? How to convert specified pages PDF to flip book in batches? What is the basic difference between PDF to ePub Converter and PDF to Flash Flip Book Converter? How to make flip book with animation effects? This entry was posted in PDF to Flash Converter and tagged command line, html to epub, pdf to epub, pdf to flash, pdf to html. Bookmark the permalink.